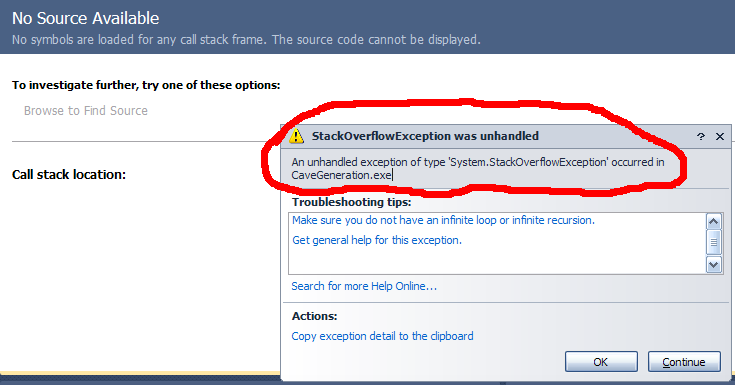 And I get this after I try to create new object from it own class. I in short explain how my cave generator works. My map is containing ID’s (integers) of the different types of cells(like wall, water or empty Space). As you can see then miner digging, he have about 8% chance that will create new miner. But then it creating it I getting error. New miner is creating at " TryToCreateNewMiner()" method. Your TryToCreateNewMiner function can call it again. If your RandomPercent calculator keeps returning true, the callstack gets deeper and deeper. Not the answer you're looking for? Browse other questions tagged objects obj exceptions or ask your own question.